Spoiler Alert: It’s pretty much the same as any other Linux system. The official documentation can be found on the Oracle website. I prefer to use BerryBoot, it makes it real easy to install several flavors of Linux on my pi. You can get it from their repo. For this example, I’m using Raspbian. If you plan to use SSH this is a good guide for setting up passwordless SSH access. When this post was written, Raspbian was using an older version of Java 8 so an upgrade is needed. There are already quite a few guides out there if you need help. I used this one. Next, we need to download and install the JCE Unlimited Strength Jurisdiction Policy Files. Now that Linux and Java are setup, it’s time to setup your Oracle Exadata Express Cloud Database. Log into your Service Console and find the Client Access section. If client access is not already enabled, you will see a link to Enable Clent Access. Click that link and follow the instructions. Once it’s done it will look like this. Enter and confirm a password. This is the password that your JDBC client will use to access your credentials. Click download then extract the file. I extracted mine into my home directory in a directory named EE_Credentials. Now we have everything in place we can try it out. In order to ensure that nothing else is interfering with our test, let’s compile a simple test class. Replace the strings for your user and password. Save this into a file called testJDBC.java. Copy the oracle driver into the same directory. We’ll manually set the classpath to keep our test self-contained. The last thing we need to do is set some system properties using the -D option for Java. Remember to replace YourPassword with the password you set above and /home/pi/EE_Credentials with the path you extracted the credentials file into. Make sure the path in the properties is where you extracted the credentials file to. You should see a tnsnames.ora file in there. If everything worked then we can make it a bit easier by moving those properties to an environment variable. export JAVA_OPTS="-Doracle.net.tns_admin=/home/pi/EE_Credentials -Doracle.net.ssl_server_dn_match=true -Doracle.net.ssl_version=1.2 -Djavax.net.ssl.trustStore=/home/pi/EE_Credentials/truststore.jks -Djavax.net.ssl.trustStorePassword=YourPassword -Djavax.net.ssl.keyStore=/home/pi/EE_Credentials/keystore.jks -Djavax.net.ssl.keyStorePassword=YourPassword"
Now we can be confident that we can connect to and query from the Oracle Exadata Express Cloud Database. To use the connection in your other applications, follow these instructions and read the documentation on setting the Java properties. If you’re using Liquibase, set the environment variable like in the example above. If you’re using OpenHab the environment variable would be named EXTRA_JAVA_OPTS. 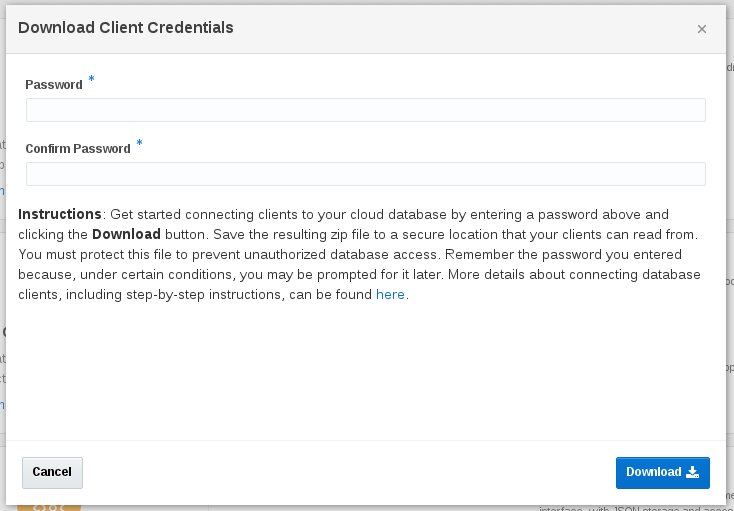 Connecting to Oracle Exadata Express Cloud Database is easy and it provides a secure reliable database to support your applications.